Welcome to your SwitchArcade Roundup for October 15th, 2018. As a precautionary measure just in case you’re having a bad bout of the Mondays, your racing renegade Phil is here with a brand new week of Switch news, impressions, releases, and sales! Before we dive headfirst into all that good stuff, let’s race on over to our Game of the Day! Last Friday wrapped up with Super Mario Party as the Game of the Day. Let’s continue with this Mario theme but instead of ending friendships through board and mini-games, let’s talk about a game that ends friendships through blue shells and last second comebacks. Mario Kart 8 Deluxe is an upgraded Wii U port of the original Mario Kart 8. 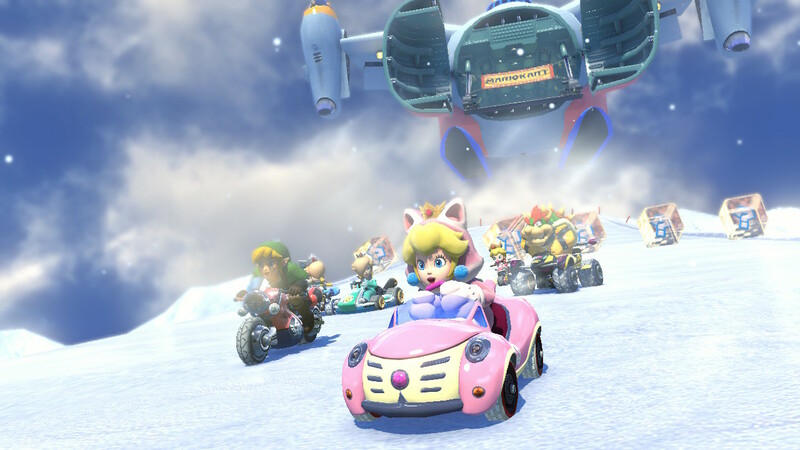 This version not only takes the original 32 tracks and includes the 16 DLC tracks of the base game, but it also features new characters like Bowser Jr. and King Boo, an upgraded drifting system (now allowing for pink sparks and subsequent boosts from prolonged drifting), new accessibility options for new and lesser skilled players, and of course, the pièce de résistance: an all-new, completely revamped Battle Mode. No, I’m not talking about your Wii U-ownin’ daddy’s Mario Kart 8 Battle Mode with its lack of actual arenas. 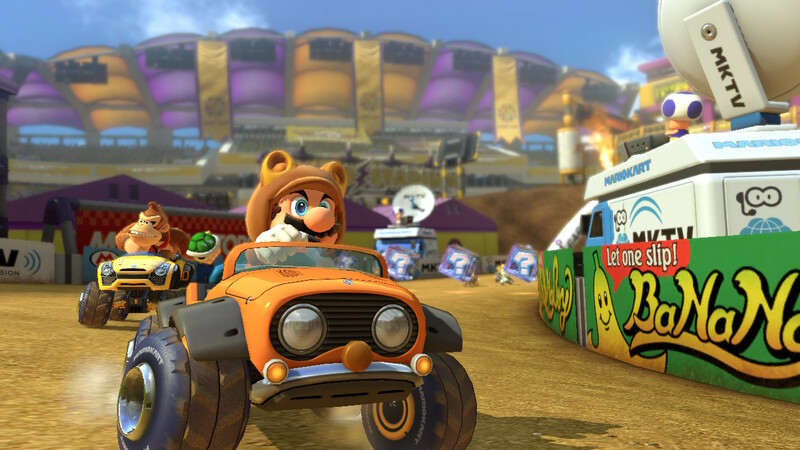 I’m talking about Mario Kart 8 Deluxe‘s Battle Mode, which is full-fledged–offering five main modes, eight arenas (four brand-spankin’-new and four remixed from past Mario Kart games), and more chaos and carnage than should legally be allowed in the Mushroom Kingdom. 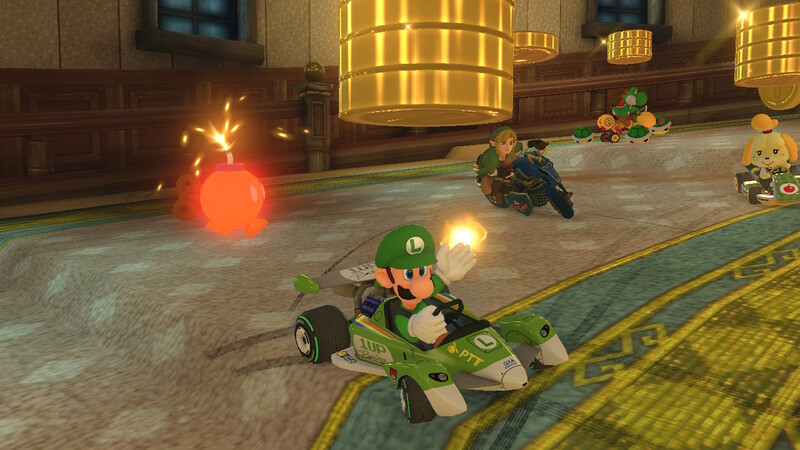 Between the standard battle mode, Bob-Omb Blast, Coin Runners, Shine Thief, and an awesome Cops and Robbers-esque mode, Mario Kart 8 Deluxe‘s Battle Mode was the welcome return to form for the series when it concerns multiplayer skirmishes. As for the base game itself, Mario Kart 8 Deluxe is still Mario Kart 8. It has its terrific and tremendous course design, with tracks looping, swaying, going upside-down, and left to right with its F-Zero-like anti-gravity sections. It has its plethora of kart parts and customization options to get the most out of your vehicle depending on what stats matter to you most. It has its sensational soundtrack (one that I couldn’t help but import because I loved it so much). And yes, it has its online mode, with its racers of skill levels that surpass mine–therefore they must be cheating. 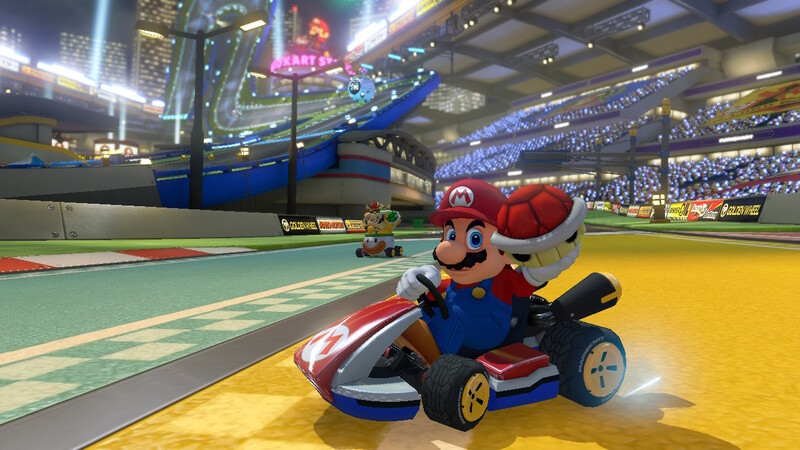 Mario Kart 8 Deluxe is an evergreen software title on the Switch–meaning, it continually sells and sells–presumably to new owners of the system looking for a fantastic multiplayer game. And that’s the beauty of the Switch and Mario Kart 8 Deluxe–one is a system that is perfect for multiplayer gaming with its split controller and “play anywhere you want" mantra. Then you have a game in Mario Kart 8 Deluxe that’s easy for anyone to pick up and play (thanks to the aforementioned accessibility options such as steer assist and auto acceleration). If there is but one negative thing I have to say about Mario Kart 8 Deluxe (and no, I’m not about to say that it’s almost TOO good) is that Nintendo might not wish to cut out the continues sales of Deluxe by introducing an eventual “Mario Kart 9" to the Switch so soon… or even at all. Yet another new Switch holiday bundle is coming to stores (I sympathize with you folks out there who want to buy them all)–this time in the form of the Nintendo Switch Diablo III: Eternal Collection Bundle. Releasing in a few short weeks on November 2nd, this console bundle will include the Switch system and dock with Diablo III branding, a digital download code for Diablo III: Eternal Collection, and a carrying case, also with Diablo III branding on it. The Nintendo Switch Diablo III: Eternal Collection Bundle will be a GameStop exclusive and will retail for $359.99. So… you might want to start scrounging up enough loot and coins to get this bundle! If you’ve been craving for more content in Hand of Fate 2, then your appetite is about to be satiated well. That’s because Defiant Development has a duo of downloadable delights (alliteration rules) in the form of The Servant and the Beast DLC–which brings a host of new content to Hand of Fate 2–and the free “Combat Reforged" update, bringing both new mechanics to gameplay and balances to enemies and equipment. Hand of Fate 2‘s DLC and new update will both arrive on the Nintendo Switch shortly, as per the dev’s press release. Switch owners of Monster Energy Supercross – The Official Videogame (stay clear of those unofficial Monster Energy Supercross video games!) got a bit shortchanged when it came to that game. Other platforms included more vehicles racing on the track at once, as well as a cool-looking track editor. Of course, the Switch version did not–for some reason that I won’t pretend to know. The sequel to the game is also coming to the Switch with Monster Energy Supercross – The Official Videogame 2. The press release mentions a brand-new career mode starring your own character, more options for the track editor, and so forth. Whether the Switch will get any of these this time around is something we can all hope for. Monster Energy Supercross – The Official Videogame 2 revs up and rides onto the Switch on February 8th, 2019 for both North America and Europe. While the MLB playoffs are in full swing (my Cards are out, so I don’t care about this sport anymore), maybe you’d like to play a digital version of the America’s national pastime. R.B.I. Baseball 18 has got you covered, then. It’s sort of the only real option for a baseball game on the Switch as well, so it wins by default. Batter up! For a Tuesday, the list of expiring game discounts is pretty short. However, Wednesday and Thursday are when business picks up! And THAT’S the ballgame! See? I did a callback to the R.B.I. Baseba–okay, I’ll just shut up and move on. This concludes this edition of the SwitchArcade Roundup. Stay tuned for next time–same TouchArcade site, same TouchArcade news channel! Oh, and keep your Joy-Cons charged and your Switches loaded with great games! Previous PostPrevious ‘Super Cats’ is a Multiplayer Arena Battler with Cats, What More Needs to be Said?